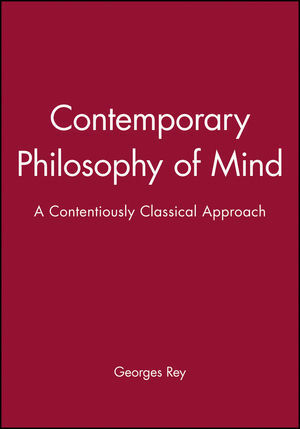 This volume is an introduction to contemporary debates in the philosophy of mind. In particular, the author focuses on the controversial "eliminativist" and "instrumentalist" attacks - from philosophers such as of Quine, Dennett, and the Churchlands - on our ordinary concept of mind. In so doing, Rey offers an explication and defense of "mental realism", and shows how Fodor's representational theory of mind affords a compelling account of much of our ordinary mental talk of beliefs, hopes, and desires. Georges Rey is Associate Professor of Philosophy at the University of Maryland. In addition to publishing numerous articles in the philosophy of mind, he is co-editor (with Barry Loewer) of Meaning and Mind (Blackwell, 1992). 2. The Temptations to Dualism. 8. CRTT: Computation (Meeting Descartes' Challenge). 9. CRTT: Representation (Meeting Brentano's Challenge). Further Capacities (Meeting Levine's Challenge).